The Titans boys basketball team is on the cusp of something good, really good. It starts with a commitment from the players themselves, and coach Brandin Hamilton saw the new attitude come into play over the holiday break. Typically, Titans disappear and practices are erratic during the holidays. This year Hamilton saw almost full participation from his players. The Titans opened play after the break on the road in Creede on Friday, January 6. While energy was high and shooters were hot, the Titans were missing their starting center and the team had trouble against Creede’s big men inside. “We didn’t have anything going inside on offense or defense,” says Hamilton. Crested Butte built a 14-8 lead in the first quarter but foul trouble and trouble rebounding allowed Creede to outscore the Titans 14-3 in the second quarter and take a 22-17 lead into halftime. The Titans recovered to tie the game in the third quarter but it started to slip away in the fourth quarter as Creede started pulling away. Then, Joseph Cummins went from hot to scorching from the perimeter. Cummins proceeded to knock down a trio of three pointers in the span of 30 seconds for a one-man 9-0 run to put the Titans up by one. 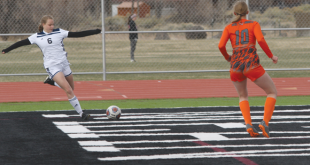 Creede tied the game eventually and when Crested Butte failed to score on the final possession, the game went into overtime. Cummins knocked down two more three-pointers but Creede’s game inside proved too much as the Titans eventually fell 66-61. Cummins finished the game leading all scorers with 29 points including seven three-pointers, followed by Nah Dumas with 23 points and six three-pointers. Unfortunately, the difference came in foul trouble and rebounding. “We just couldn’t get any rebounds,” says Hamilton. The Titans returned home to then host the Sanford Indians on Saturday, January 7. Sanford has dominated 2A basketball the past three years winning three state titles in a row, but graduation depleted the Indians’ squad this season. Nevertheless, Sanford has a tradition and is always tough with a new influx of talent each year. 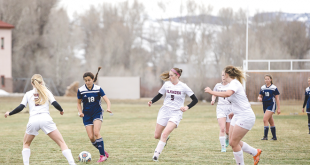 Given the fact that Crested Butte suffered some of its most lopsided losses to Sanford the past couple of years, fans were expecting the same situation on Saturday. “I fully expected we could win the game,” says Hamilton. That attitude carried into the first quarter as the Titans went toe-to-toe with Sanford up and down the court. Sanford jumped out early to a two-bucket lead, but when Cummins converted a three-point play it was game on. Dumas closed the first quarter driving to the hoop for a layup in traffic to tie the game 11-11. The Titans then owned the first three minutes of the second quarter. Cummins buried a three-pointer and was fouled, hitting the free throw for a four-point play. A steal on the Indians’ next possession led to a quick pass up-court from Jovany Aguirre to Dumas for another basket and the Titans were up 17-11. Then foul trouble hit the Titans as David Wasinger had to sit with three fouls, leaving a big hole in the Titans line-up. Sanford looked to exploit the advantage but the Titans bench came through to keep Sanford from taking off. Sanford built a 24-20 lead with two minutes left and Hamilton called on his players to run Berkeley, a time-eating offensive set that can cool off an opponent. The Titans ploy worked as Sanford was left without a basket in the final two minutes and the Titans returned to full strength in the third quarter. Wasinger went to work immediately, scoring inside on the Titans first possession. Tommy Linehan hit an eight-foot jumper and the game was a full-on dogfight until foul trouble reared its ugly head for the Titans once again. The Titans remained tough throughout the fourth quarter and were within three points when Linehan scrambled after a loose ball and kicked it to Cummins for a three-pointer. Sanford called a timeout and clamped down, ultimately sealing the win from the free throw line as the Titans’ woes from the free stripe and foul trouble spelled their eventual 44-33 demise. Cummins led the Titans with 17 points, with Dumas dropping in 11 points. They now look to return to their winning ways during a three-game home stand as the Titans host Cripple Creek on Friday, January 13 at 7 p.m., South Park on Saturday, January 14 at 4 p.m. and then Ridgway on Monday, January 16. “I think those two losses made the team even more determined,” says Hamilton.